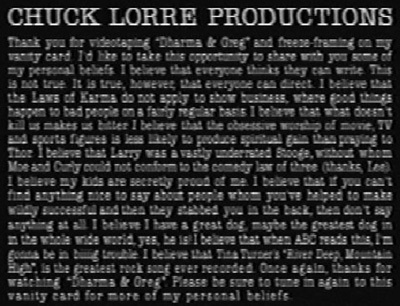 The following is an old vanity card that I thought was worth running again. Once upon a time there was a wave. The name of the wave was, no surprise, Dave. Dave the wave. Dave was a big, powerful wave. His massive blue body surged across the surface of the ocean with great majesty and deceptive speed. Oh yes, Dave was quite a wave. From the moment he rose up from the ocean he felt special. He felt invincible. Ferocious storms battered him with wind and rain, great ships sliced through his very heart, and yet he rolled on. It was not for him to stop and consider the other waves. To stop was to die. Waves have to keep moving...or else. But then one day Dave saw a strange darkness on the horizon and, for the first time in his life, felt fear. What could it be? Was it connected to the laughing creature sliding across his face on a piece of wood? But before he could make sense of it all, he crashed down into darkness. For a brief moment he felt a weird, splashing feeling, then oblivion. Dave was no more. He was now a part of the sea. And as we all know, the sea loves to make waves.